Food Costs > How Much Does a Pomegranate Cost? How Much Does a Pomegranate Cost? The pomegranate is considered to be among the oldest and healthiest types of fruits that originates in the Middle East. This is the type of fruit that comes with the rich antioxidants that help the human body fight off the free radicals inside. Historical records show that this fruit has been transported from various regions in the Arabic world and has come into the Western culture because of the flavors that it offers. For the United States, the fruit became popular when the Spanish settlers brought it to the California coast in the mid-1700s. On average, you should expect to pay anywhere from $1 to $3 for one pomegranate. This price can be higher or lower depending on the season, wit the fruit in season during the months of September, October, November and December. Hawaiifruit.net stated the average cost for their processed fruit would be around $5 per pound. Rather than purchasing a whole pomegranate, you can simply purchase the pomegranate seeds. This is ideal for using the pomegranate as an ingredient since the seeds are sometimes tough to remove. If purchasing the seeds only, the costs can be between $1 to $2 per ounce. On the Huffingtonpost.com, they state that the ready-to-eat type of seeds of the pomegranate will be around $4 for a 4-ounce container. Juice made from the seeds of a pomegranate, on the other hand, will often cost $0.70 to $1.25 per ounce. For example, the popular Argo Labs Naturally Pomegranate 32-bottle retails for $22. A pomegranate, according to Aldi, is known to be the jack-of-all-trades due to its fiber and vitamins C and K. It’s also a great source of potassium, copper and folate. The pomegranate juice comes with the minerals and vitamins that will actually help in the prevention of the hardening of the carotid arteries. This means that you get to stay looking young because of the rich antioxidants that permeate the juices of the fruit. The processed types of pomegranate that come in pills will come with the same nutrients that are found in the actual fruit. The seeds of a pomegranate are composed of an outer membrane known as the aril. The aril is filled with succulent juice that surrounds to hard inner seed. You can choose to use a press to simply get the juice out of these seeds, or you can eat the entire thing. If you do decide to eat the entire thing, many people suggest that you do not bite into the inner seed but rather swallow it whole. The reason for this is that the seeds do not taste that great when chewed. However, despite what some people may say, there are no health risks associated with eating the seeds. Choose pills and supplements that have the least amount of preservatives and chemicals as this will help you get the best reactions from the pomegranate. When choosing a pomegranate, make sure that it feels heavy. The skin should also feel firm. 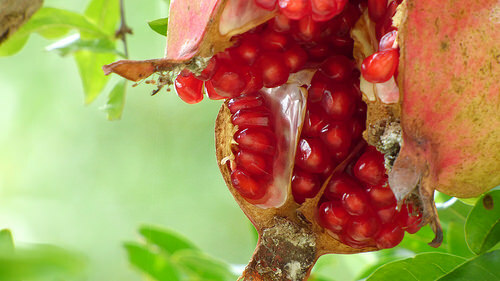 When you remove the seeds from the pomegranate, they can be kept for up to three days. If you want to freeze them, they can be stored in a freezer for up to six months. If you have a farmer’s market in your local area, consider checking it out. What you may find is that local farmers here are selling it for a fraction of the cost. Whole pomegranates will always be cheaper than buying the seeds. A whole fruit, on average, should yield close to 16 ounces of seeds or 613 seeds.